Now it its 11th day, the occupation of Wall Street is gaining steam. Despite arrests, police brutality, and a lack of resources, what started as a group of people sleeping in a park has sparked a national wave of protests against the broken U.S. financial system. So far at least 52 cities in America are occupied or organizing. With similar actions planned on at least three continents. Despite the abysmal mainstream media coverage, the word is spreading, and people are looking for ways to get involved. Here are 5 ways that you can show the Occupy Wall Street movement that you stand united in revolution. This is the easiest way to support the occupation, but it just might be the most important. Mainstream publications like the New York Times have failed to bring the true story of the protest to the eyes and ears of the American people. That’s why it’s essential to spread the word via any and all social media platforms. Like the OccupyTogether Facebook page. 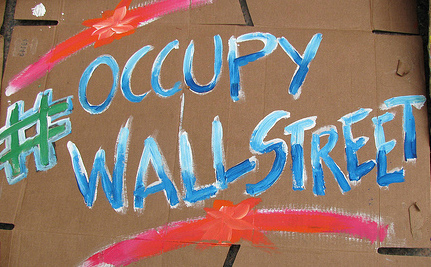 Follow the @OccupyWallSt Twitter account and retweet it using the #occupywallstreet hashtag. Watch for stories, videos, and pictures of the Occupy Wall Street protest on Care2 or your favorite blog, and share them to Facebook and Google+. Occupations or similar protests are now planned or taking place in over 50 cities across America. If there’s one near you, GO. Showing up for just a few hours makes a huge difference. Wave a sign, bring some water or markers, listen to a speech, sign a petition, or share your own thoughts. All you need is your body and a burning desire for true democracy. It’s taken hundreds of years to brainwash the American people into believing that “corporations are people,” and that we need them to survive. Look for ways to embrace collaborative consumption in your own life. Share your space, time, bike, car, money and food. Buy or swap used items instead of purchasing new ones. Rent, grow, and build things instead of buying them. Banks and other corrupt corporations have held our financial system hostage for long enough. Deny them excessive profits by cancelling your credit card, moving your money to a credit union and pledging to use cash whenever possible. Thank you and will be done to the best of my ability. Thank you for covering this important event! Power to the People!!! Close your bank accounts!!! A little bit goes a long way, remember the loaves . . .
...if the universe, the entire universe, were to focus energy upon compassion, empathy, gratitude, love, peace, harmony, kindness, forgiveness and peace... imagine a planet called heaven. It is good to see real, honest Americans out protesting the demise of the American Middle Class, and the rise of the new American Feudalism. Curiously, their arguments and frustrations are nearly the same as what the Tea Party Protestors were saying just 2 years ago. The key difference: this really is a 'rag-tag' grass-roots movement - hence the disorganization. Unlike the highly organized rallies of the Tea Party which were nothing more than a co-opting bought and paid for by the Koch Brother$. "By giving money to 'educate,' fund, and organize Tea Party protesters, [the Kochs] have helped turn their private agenda into a mass movement,"